The wiring harness is the smart communication network in every modern car. This network is connected to as many as a hundred ECUs (Electronic Control Units), also known as ‘nodes,’ that control the electronics in the car. These days, all modern cars contain these nodes, ranging from two nodes in the Tata Nano (city car manufactured by Tata Motors, made and sold in India) to over a hundred in a Mercedes S-Class. A modern car has dozens of different electronic units on board, such as the engine management system, power steering, electric windows, air conditioning, lighting, etc. All these units are controlled by chips that use the wiring harness to communicate with each other. The picture below shows a wiring network of a midsize car. 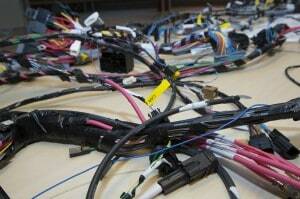 An average wiring harness consists of over a thousand wires, weighs 45 kilos and measures a kilometer in length. However, the amount of electronics in cars is booming. Motorists want more features, such as navigation, Bluetooth, and parking sensors and governments want to reduce CO2 emissions. More often drivers have to pay more taxes for cars that are heavier and more polluting. As a result, manufacturers are constantly increasing car safety through e.g. ‘adaptive cruise control’ and stabilization programs and trying to reduce the weight of the car. All these applications require electronics. The consequence of this development is that the wiring harness in a car has to meet increasingly high demands and has to function in smarter way to make the car lighter and reduce fuel consumption. 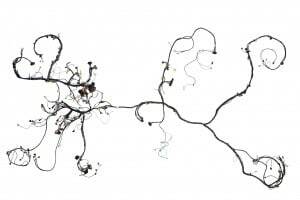 The wiring harness actually consists of different data networks: CAN, LIN, and FlexRay. There are two reasons for this multiple network interconnection. The first reason is a historical one. Innovations in cars are evolutionary in nature, so when a new technology has been implemented, it takes many years before it is completely replaced by a newer one. The second reason is cost-related. For example, a LIN network is relatively simple and cheap, but very suitable for controlling simple applications such as electric windows and central locking. However, because of the need for bandwidth of the growing amount of information (sensors, etc.) in cars, and the wish to make cars lighter, we also need complex networks with a high bandwidth, such as FlexRay. What is essential for a network to be reliable is that ‘a message’ sent by the ECUs is guaranteed to be executed immediately, especially where passenger safety is concerned. If the brakes have to be activated, this has to happen straightaway. The older LIN and CAN networks are not so suited to this purpose and are fairly slow, but FlexRay can meet these requirements. In a FlexRay network, each application has its own time slot in the network, so that it is known exactly when the signal can be sent and will be received. This guarantees that an application can always send information through the network. In addition, the network is 10 times faster than CAN, which means fewer wires are needed, which in turn means less weight, and ultimately less fuel. The next step towards even faster networks has already been taken: Ethernet, with a bandwidth up to 100 Mbps. Ethernet enables more cameras in cars, such as the reverse camera, enabling motorists to see people or objects that are directly behind the car, a rear view camera system to prevent collision damage and personal injuries of infants and the ‘bird-view’ application, which allows motorists to see ‘around the corner’, for example when leaving a parking garage. With Ethernet it will also be possible to improve the safety systems in cars such as ESP and ABS to control the cars dynamics under more difficult circumstances like snow and ice.